The Romanian companies of the SWARCO Group representing ITS and RMS divisions join forces to show the world that SWARCO is a one stop shop regardless of the solution you are looking for. As a first step the two companies, SWARCO Vicas and SWARCO Traffic Romania started to attend events together and jointly present SWARCO solutions. 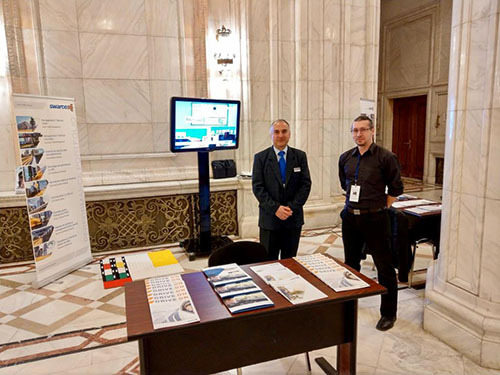 Their first joint event was “The 15th Romanian National Congress of Roads and Bridges”, organized by APDP Romania (The Professional Roads And Bridges Association Romania). The Congress' main topics were: sustainable road infrastructure, traffic mobility and road safety, environment and climate change. The second event where the two companies participated was a conference called “Smart transportation, smart traffic” organized in Bucharest by Jump to SMART-eRomania. The event was focused on urban traffic management topics like smart parking, smart driving, electric vehicles and environmentally friendly transportation systems. The main aim for this initiative is to let people know that traffic management is connected to road marking and you can find a solution for both in SWARCO.